When I hold in my hands a new Matthew Mills release, I feel like a child who’s got its favourite present! His brand new album is another fine example of how supersonic, flash - lightning and precise Neo-classical Metal should be executed! From the opening notes of “The Fury Of Speed” you can easily understand that the whole album is a feast of Virtuosity and high-demanding playing! Matthew is not only focusing on speed, but he also puts intense mid-tempo tracks, such as “Soul Cage” and “Dawn” which once again proves that now Neo-classical Metal player omits emotions from his playing! 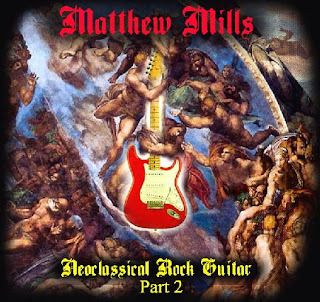 “Neoclassical At The Show” features also Matthew’s splendid acoustic guitar playing and the result once again is magical! It’s really hard to pick some certain tracks as favourites ones from the album you cannot do that with Matthew’s albums. Every track has a highlight and showcases the potential of this gifted guitarist! I only wish next time to find an appropriate drummer so that his tracks will include that pounding rhythm section they deserve! There are also some guests on the album such as Mike Orlando, who performs a guitar solo on the above mentioned "Soul Cage” and also Sean Baker, which contributes his skilful playing on "Castle Of Doom”. I used to believe and I still support my opinion that Matthew Mills hasn’t received yet the recognition he deserves. His abilities are beyond the mind of the average professional performer and the scene should soon realise that this “hidden ace” can offer a lot more. I wish also his CD with Forgotten Realm to be released soon because I have the feeling that we will blown away from the mix of Matthew’s furious guitar and David Fefolt’s ground-breaking vocals! I can’t wait. Check out Mill’s mySpace profile http://www.myspace.com/matthewmillsinstrumentalguitar and his web-site: http://www.mattmillsmusic.com/ for further info on how you can purchase his works, while I am going to listen to his new album again…and again…and again!!! Thank you Matthew! Welcome to Magic Starlight blog!